Above is a photo snapped by Mary Wilde at Ogston Reservoir in Derbyshire. It shows two great crested grebes in courtship. The male is presenting the female with what would, naturally, be food, but here the offering is plastic. We hear much about the impact of plastic on the oceans, and sealife, but the problem is here in Derbyshire too, affecting our wildlife. 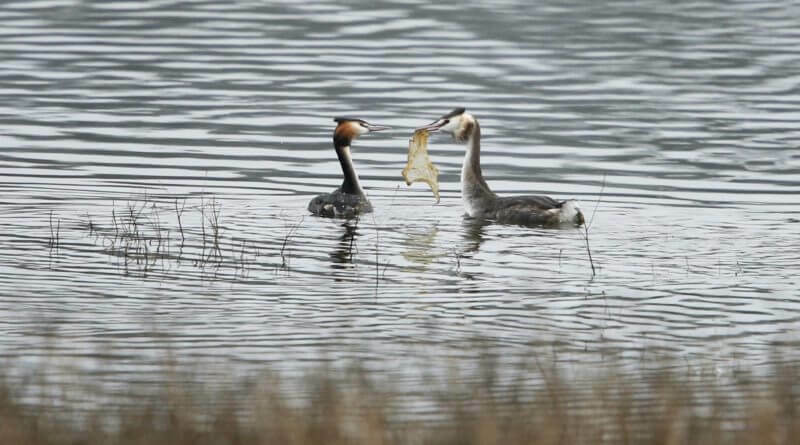 Birds and animals in Derbyshire are frequently caught in plastic, or eat it, which clogs their insides and can kill them. It pollutes habitats and has found its way into nesting materials and protected environments, as well as rivers and ponds. Anywhere humans walk is littered with wantonly discarded wrappers, which damage the wildlife and the environment. Sue’s Sustainables, in The Gatehouse at De Bradelei Court is Belper’s resource for plastic free goods.